Catalog Page 47. 6" & 8" Thrifty Animals for sale. Catalog Page 47. 6" and 8" Thrifty Family stuffed animals for sale. The Thrifty Animals have a very affordable price. Both the 6" animals and the 8" animals have embroidered eyes with custom printed t-shirts featuring your logo or custom slogan. Both of these styles are new to our line. We sell many styles of teddy bears with embroidered eyes. You can mix and match the animals style or t-shirt colors for no additional charge. 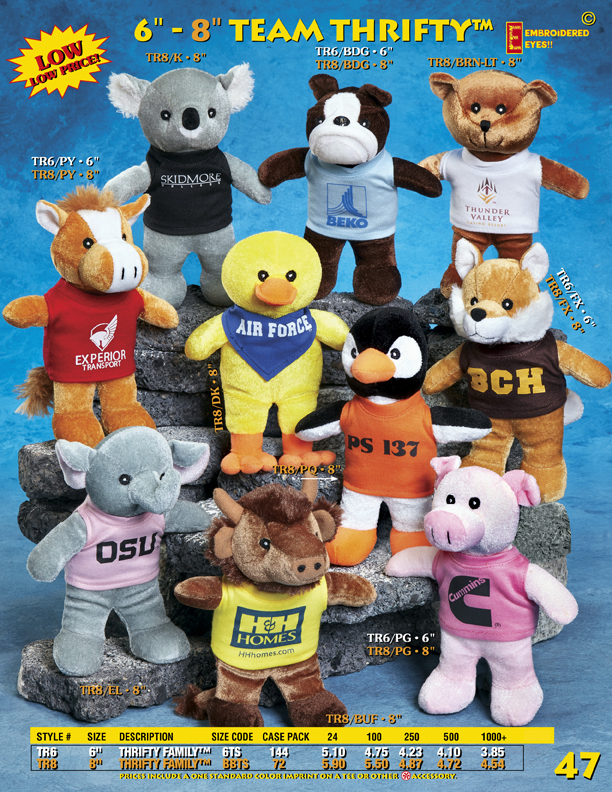 These animals offer an inexpensive alternative for buying personalized stuffed animals. Not all animals are available in 6" and 8" sizes. Look at the item number to determine the size offered.